I thought I'd share some of the fabrics my mom gave me recently when she found out I'd bought a sewing machine. They're pretty fabulous. The birds would work well with Girlonthrocks' home decor color palette. 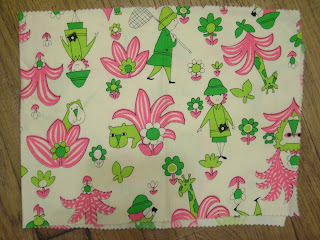 I fould a 70's era McCalls pattern for tank tops at the East Bay Depot, and I think I might try it with the yellow seersucker first. The safari print is my favorite, but I have sooo little of it. I'm going to have to think of something special to do with it. 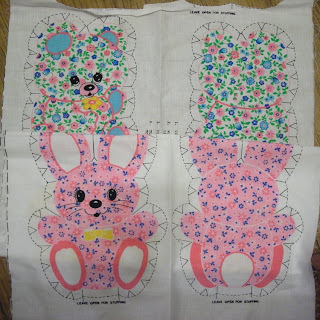 Finally, my mom also turned up these stuffed animal patterns that are pretty damn cute. There's also a yellow duck. I'm in the process of scanning them to I can make them into iron-ons in the future. hmmmm. Perhaps I should do that with the safari print too. 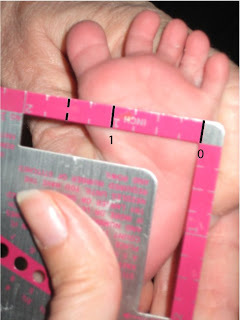 How big is a baby's foot? This is a question that comes up all the time at the Mel-o-dee knitting group. None of us have children and we've learned the hard way the babies have oddly large feet. So with the birth of my new nephew, I thought I'd take the opportunity to document his feet for future reference. Here is the first set of photos, he is two weeks old, 10.5 lbs and 23.5 inches long (apparently that's way above the 99th percentile in length). He has put on 2 lbs since birth and grown about 2 inches! 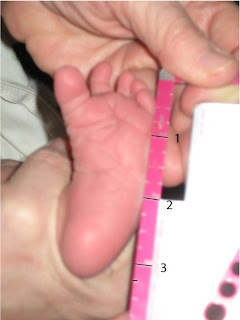 Based on the photos, I would put his foot length at 3.25 inches and the width at 1.5 inches. Man, the poor guy was NOT happy to have these photos taken. He was nice and warm in his PJs and we thrust him out into the cold. I hope he doesn't subconsciously associate me with trauma now! 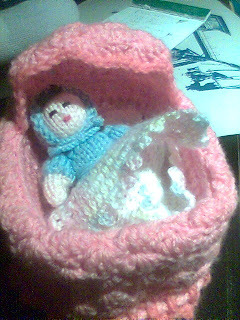 Here are two bad cell phone pics of a doll and cradle that my Aunt knit for my niece. The base is a plastic margarine container and the skirt lifts up to drawstring closed. 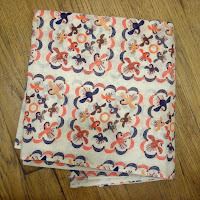 Here is a picture of the first thing I sewed on my new sewing machine. 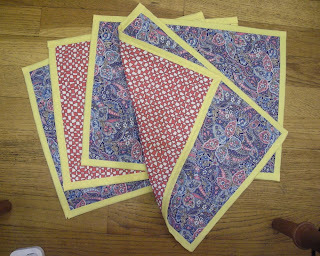 Placemats! 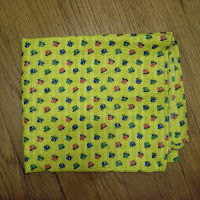 They are double-sided, with two layers of cotton and a layer of flannel on the inside. Using flannel instead of interfacing was a suggestion in the book "Bend-the-rules Sewing". Apparently it makes for a more fabric-like feel when its all done. Which I can attest to, though I've never used interfacing. 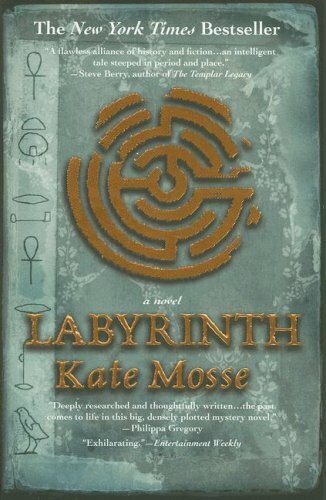 All the pieces were sewn together and then I covered the edge in store-bought binding. They gave me a lot of practice on sewing binding and if you look closely you'll notice that the corners of the binding are different on each placemat. 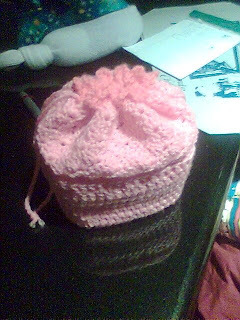 I think I like the last one I did best, which involves wrapping the binding around. Now if I ever clean the sewing stuff off my table I might be able to use them.